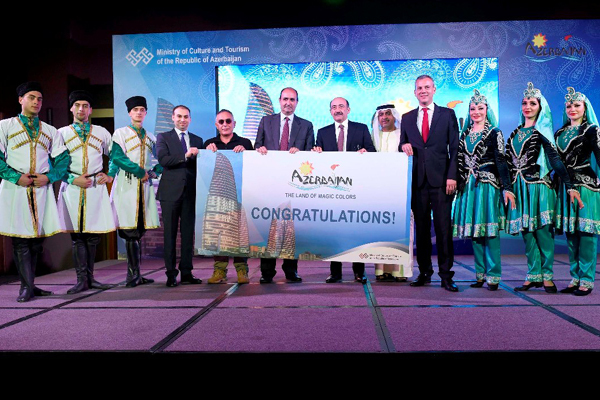 The Ministry of Culture and Tourism of Azerbaijan has concluded its historic roadshows and gala dinners in Qatar and Kuwait. The roadshows were aimed at strengthening relations between Azerbaijan and the GCC nations, developing co-operation in the field of travel and tourism and to disseminate information about tourism in order to diversify Azerbaijan’s dependence on oil and gas, as the development of tourism is currently a key priority for Azerbaijan. The gala dinner guests included representatives from government offices, dignitaries, diplomats, VIP’s, media professionals, pioneers, experts and leaders of the travel industry. The minister spoke about the importance of the Middle East, particularly the GCC states for Azerbaijan’s tourism. He shared all his best experiences working in cooperation with Qatar and Kuwait. “The Government of Azerbaijan has lifted advance visa requirement for citizens of the five GCC countries, as well as Japan, Malaysia, China, South Korea and Singapore. Now visas are given upon arrival for the GCC nationals. This is a milestone in our relationship with these countries,” Garayev told the media. Rashid Al Noori, chairman of the representative office of the ministry of culture and tourism of Azerbaijan in the GCC presented Azerbaijan’s travel and tourism portfolio and highlighted the importance of these roadshows. He said that the roadshows help deliver the minister’s message to a wider audience and to welcome GCC nationals to Azerbaijan.